Riad Farhat, Jason Berg, and Piet van der Graaf, known in the Amsterdam hospitality industry as the “three wise men from the East” or 3WO, have been steadily polishing up the profile of Amsterdam’s restaurant and bar scene with cleverly chosen concepts that perfectly mesh place and time. Hello Amsterdam spoke to Riad Farhat about how they got where they are today, and what’s next. Ever fantasized about opening your own bar over a beer with friends? Most bar lovers have at least once, usually at closing time. And then everybody cheerfully goes to bed and nothing comes of it. Not so with the “three wise men”, who made their dream a reality and have now opened 10 hospitality concepts in 8 years. It all started at Elsa’s Café on Middenweg, where Farhat and Berg were employed for the summer. They were both 17 years old and working under the watchful eye of Van der Graaf, the owner of Elsa’s and an old hand in the industry. For their graduation project, Farhat and Berg, who were both studying at The Hague Hotel School at the time, wrote a business plan for several catering businesses in Amsterdam East. In 2007, a bar became available on Beukenplein, in what was still a pretty rough part of the neighbourhood back then, but that’s exactly what the trio was looking for. From the outset, they wanted to start “something special and unexpected” in a neighbourhood that was not yet well established. Says Riad Farhat (37), “Café Maxwell is still my favourite, perhaps because I spent 3 years working behind the bar there. It has something special for me because it was our first.” Brown-café-style Café Kuijper on Linnaeusstraat soon followed, but it was only with the runaway success of De Biertuin (“beer garden”) across from Oosterpark that the trio really started to make a mark in the local hospitality industry. The concept of craft beers and roast chicken proved to be an instant hit in Amsterdam. “It’s been going really well since day 3 when it exploded, and it’s never really changed,” says Farhat. And, after local newspaper Het Parool named it the “best burger place in Amsterdam” in 2013, the popular neighbourhood spot suddenly started drawing in people from all over the city. Until then, Amsterdam East was not typically somewhere you’d choose to go out. Even residents tended to head into the centre back then. Success seemingly follows success for the trio because, says Farhad, “Six months ago we opened our second one on Prinsengracht, which is doing great, and we’re now looking for locations to open more Biertuin cafes in the five other big student cities in the Netherlands. So, if you hear of something, let me know,” he jokes. Later, the “three wise men” took possession of rundown Parkcafe Engels on the corner of Oosterpark and Beukenweg. This soon become the new hotspot of Amsterdam East: Bukowski and Henry’s Bar, the latter of which was awarded the title of “Best New Cocktail Bar in the Netherlands” soon after. Adding to their triumphs, Smokin’ Barrels (a burger and lobster concept) opened, followed by another instant success with a Surinam-themed spot – this time on the western side of the city – called Waterfront. Eddy Spaghetti, a pasta bar on edgy Krugerplein was next. 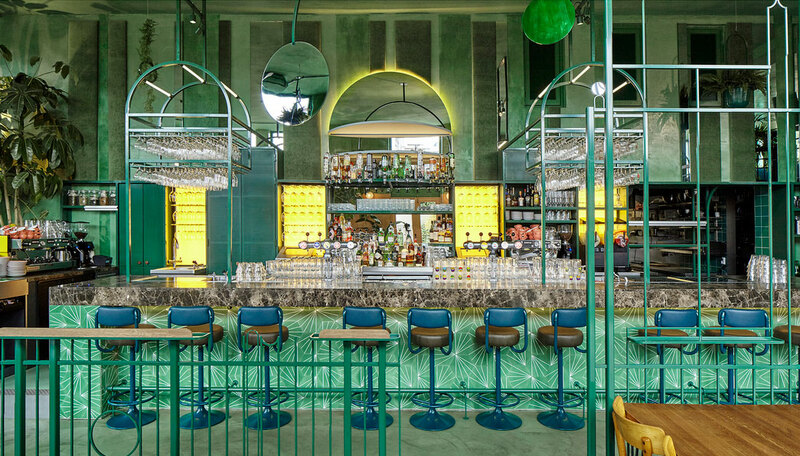 “Entire neighbourhoods have flourished in Berlin, Paris, London and New York, and it all starts with opening good bars and restaurants,” believes Farhad. In fact, the partners are not looking for uniformity, but believe they have a responsibility “to make the district more fun”. Today, Farhad feels, “Amsterdam can easily measure up to the top 5 in the world. We’ve had a whole new generation coming up and they travel a lot. Everywhere you go in the world – even deep in the bushes of South Africa – you hear people speaking Dutch, and everywhere we go we pick up things and bring those ideas back. And, while this is something that we’ve done for centuries [as a trading nation], you’re now starting to see people coming here to find new concepts. Recently a Louie Louie and Cannibale Royale opened in London, so the world’s looking at us now and that’s really cool. It’s an honour that people from other cities are coming here to see what we’re doing,” he says. Looking forward, he thinks Amsterdam will become one of the biggest players in Europe, and that its hospitality industry is going to evolve even further. While many of Amsterdam’s brown bars and simple eetcafés are currently disappearing, Farhad predicts that these typical Dutch establishments will make a comeback. “Our brown café, Café Kuipers, gets busier every year. There is a part of the Dutch who still love the brown café with a bitterbal and blokje kaas and want to knock back a few beers without it all being too complicated. Or an eetcafe with satay and simple food. If you do it well, there’s nothing wrong with it. In fact, it’s something we’re actually busy with right now,” Farhad confides. What else is next? “Our big dream is still to open a hotel, and while it would be great to do a top-to-bottom concept incorporating sleeping, eating and drinking, the “hotel stop” in Amsterdam [a municipal ruling that has banned the building of new hotels in the city centre] has made this much harder to do. Still, we’re very open to partnering up with a hotel, because the hardest part for most hotels to get right is the restaurant and bar part. At this point we’re keeping all the balls in the air, waiting for something to fall. We’re potentially looking at projects in West and South, but we don’t know what will go through when, if anything at all. Everything is going really well in Amsterdam, the local economy is robust, so there’s a lot of competition and it can be hard to find the right place. We are happy with what we’re doing, but when opportunities come knocking we’d like to go for them because that’s the most fun part – being creative,” he concludes.